One of America’s most influential writers, Ray Bradbury thrilled read ers for decades and produced some of the defining works of the 20th century. For me, he defines a particular time in America—one of wonder and worry: the promise of space travel and the portent of a bookless dystopia. For more on Bradbury, below I’ve pasted the essay I wrote upon his death this past summer. “The Moonless Sleep” appeared in Transgress magazine, alongside a Bradbury tribute by the talented Stephanie Train. But for all the great fiction he produced throughout his lifetime, I remain in awe of his 1955 debut, The October Country, a collection of short stories originally published by Arkham Press as Dark Carnival. Blaze on, ye dark carnivals, with the steam-wrought thunder of a midnight train! Gather ye lunatics, barkers and graveyard melancholics along the autumn midway! For Cooger and Dark’s Pandemonium Shadow Show has come for its maker. And sadly, under the Big Tent of terrestrial existence, the Time Carousel spins only one direction. There will be no unwinding of the years. No flip-page fountain of youth. No restoring the burnt ashes to books. On Tuesday, June 5, Ray Bradbury—master of the grimly fantastic—died at the age of 91. He left behind hundreds of stories, novels, screenplays, teleplays and nonfiction works, spanning 1947’s Dark Carnival to last month’s essay, “Take Me Home,” in The New Yorker. Bradbury enthralled a long-ago generation with the possibilities of space travel and the terror of a foreseen dystopia. The man’s got a Hollywood Star, an Emmy, a Pulitzer special citation and has had a moon crater and a freaking asteroid named in honor of his work. So here’s to one of the true giants of American literature: A bittersweet slug of dandelion wine. Drink hearty, my friends. Growing up a horror fan in the 1980s, I worshipped the holy trinity of Poe, Lovecraft and King. But there was always space on my bookshelf for Bradbury. It began during summer vacation—1984 or ’85—when HBO broadcast Something Wicked This Way Comes. I watched it every chance. I memorized every scene, every line. I still see the smoke of the train, feel the tickle of the tarantulas under the sheets and tighten with unease recalling Mr. Dark littering the library floor with the torn pages of Jason Robards’ life. I identified with young Will Holloway—the nervous, homebound boy who preferred travels of the imaginary and literary variety over the untamed severity of Jim Nightshade. So began my infatuation with carnivals and the leitmotif of illusion, midway facades and the bittersweet escapism of the roadside attraction. It’s probably why I find carnivals appealing in art and depressing in real life, sort of like a dive bar during the day. Something Wicked This Way Comes chilled me as a child, then moved me to tears as an adult when I recognized the undertone of melancholia in the narrative. I re-read it in my thirties and realized it was not so much the story of two boys, but rather the story of the father. The old man. Jason Robards in the safety of his library, puffing a pipe in a long-gone American pastoral. Fahrenheit 451 rallied me as an angry young man, and still rumbles in my blood, much the way the dystopian works of Vonnegut continue to invade my thoughts nearly every day. We read “A Sound of Thunder” in elementary school, and I still feel the quiver in the back of my neck when we came to the end. And can anyone with an iPhone not consider “There Will Come Soft Rains” as prescient as it is brilliant? Perhaps my favorite Bradbury work is The October Country, a stripped-down version of his story collection Dark Carnival. Even now, “The Crowd” is as haunting as ever, “Homecoming” is still creepy as hell, and I was so enamored that I once penned a prequel to “The Wind” as part of my creative writing thesis at Penn State. Of all the dark treasures in The October Country, none affected me more than “The Scythe,” a treatise on the life cycle that feels appropriate in the wake of Bradbury’s passing. In the story, a Dust Bowl family breaks down on a dead-end street, starving and desperate. They discover a farmhouse whose owner has died, deeding the property—rich with wheat and livestock—to whomever discovers his corpse. Of course, there is a tangled string attached. Though best known for his fantastic vision and plotting, there is much to admire in Bradbury’s craft. The deceptive modesty of his prose, disguising his poetic bent. His command of flow and revelation. The comforting familiarity of the most unreal environs. How did he do it? I’ve been asking that question for a few decades now, but still no luck. His book on craft, Zen and the Art of Writing, is one of the most inspiring writing primers ever penned. But like a great magician, Bradbury is just as mysterious whilst revealing his secrets. I was fortunate to meet the author in June 1999. Bradbury spoke at the Chautauqua Auditorium in Boulder, Colo. He discussed his cinematic approach to writing. He said that people sometimes asked him how to adapt one of his stories into a film, a query at which he expressed disbelief. To paraphrase, he answered: Read it from one page to the next. “Page one, scene one.” Write as if you’re making a movie, he implored the aspiring authors in attendance. Other tips centered on when to write that first novel (Don’t even bother until you’re thirty) and how (by threading together a series of short stories). Short fiction is rough waters for a young author—even someone of Bradbury’s talent. In the early days, he met with publishers who liked his writing, but ultimately turned him down: Call us when you’ve got a novel, they told him. Nobody wants to read short stories. Undeterred, Bradbury got the last laugh. He repackaged and re-pitched those rejected story collections as the “novels” The Martian Chronicles and The Illustrated Man. They were published in 1950 and ’51 respectively. He offered other anecdotes and advice, but honestly, I don’t recall much of it. I was too enthralled with his stories. I was also shocked by his appearance. For years, he’d been using the same photo on his book jackets: a kindly, slim, frost-haired middle-ager. That was my image of him until he hobbled onto the stage, heavyset and a decade or so older than his picture. Throughout the talk, the altitude played hell with his breathing. His hair was shaggy and unkempt. When the talk was finished, he was helped down a set of stairs to meet with fans. His legs were unsteady as he navigated the steps. An assistant held his left hand. In the right, he clutched a freshly cracked beer bottle. He held it steady and savored a long drink when he reached the small table where he would sign books. A pen in one hand. A beer in the other. I thought: This is my kind of guy. This is my kind of writer. I trembled as I approached the table. 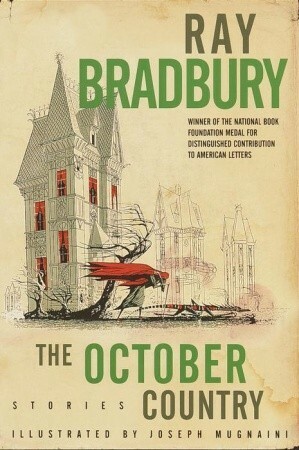 Bradbury penned a new introduction to the 1996 edition of The October Country. It was fittingly titled, “May I Die Before My Voices.” It refers to the muses that compel him to write—the daily imaginings that inspire his stories. To some, those voices would be a burden, a form of madness. For Bradbury, it was his raison d’être. He closes his introduction with the breathtaking lines: “If some morning in the future I wake and there is silence, I’ll know my life is over. With luck, on my last day, the voices will still be busy and I will still be happy,” (viii). I can’t say if the voices were still speaking to him on June 5, but I feel comfortable saying that Bradbury’s voice is as resonant as ever. More than half a century after the release of Fahrenheit 451, dystopian literature still tops the best-seller and box-office charts. The universe is as mysterious as ever, and we have yet to walk on Mars or time-travel to hunt dinosaurs. For these reasons, his timeless visions will continue to enthrall. I will certainly die before Bradbury’s voice gives out, and I’m happy to think that there will come future generations that will be equally comforted and inspired by his words. His prose that rockets off the page, that transports the reader in time, space, and can elicit moisture in the eye as effortlessly as a scream in the throat. Bradbury’s gone, but his voice remains. To thrill us. To haunt us. To fill us with wonder. To remind us that we need not fear the voices in our own heads ever going silent. Because hopefully, surely, our voices will resonate beyond our meager, terrestrial lives.